Sure the Sooners lost 4 players in the first round (Sam Bradford, Gerald McCoy, Trent Williams, Jermaine Gresham) and they have just five returning starters. But things look bright in Oklahoma. Quarterback Landry Jones returns and now he has almost a year of experience under his belt. Running back DeMarco Murray, an All Conference Selection, also returns and takes pressure off Jones. 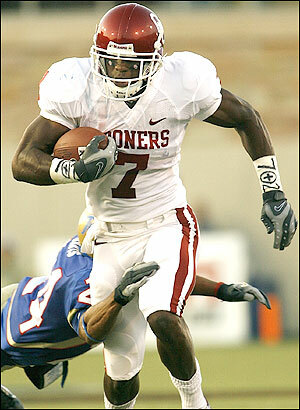 Same with wideout Ryan Broyles another All Conference Selection. On defense end Jeremy Beal in highly talented and will put constant pressure on opposing QB's, which will help senior safety Quinton Carter. Key Games: Oct. 2 vs. Texas Quick Pick: Can the Sooners put enough pressure on Garrett Gilbert? And can the Longhorns to the same to Landry Jones? Texas wins. Nov. 27 vs. Oklahoma State Quick Pick: The rivalry will test both the Cowboys and Sooners but Jones has a big game passing to Ryan Broyles. Oklahoma wins.